Fujifilm has rolled out its second camera for the day, this time introducing the super rugged FinePix XP200, which has a sporty outdoors-centric design that looks tough enough to handle a tumble down a mountain side. Less you be tempted to think this camera is all looks, however, it also boasts a variety of higher-end features, some related to its ruggedness and others offering the various functionality you’d expect from a camera in this range. First up is its durability, with the camera boasting a handful of features that makes it an outdoorsy camera worthy of trips to harsh environments. 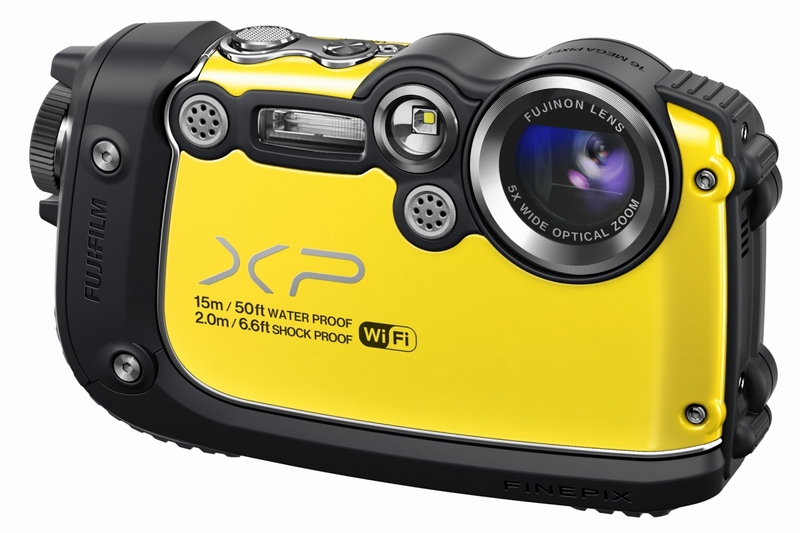 The FinePix XP200 is waterproof to depths of 15-meters, with Fujifilm boasting that it offers “crystal clear quality” when submerged. Likewise, the camera is shockproof against drops from heights up to 2-meters, and is dustproof. If you’re one to tread into cold territory, you’ll be happy to know the camera is also freezeproof, able to withstand temps down to -10C. Those features aside, the XP200 also offers wireless image transfer to both computers and mobile devices via either the Fujifilm PC AutoSave program or the Fujifilm Camera Application, depending on which device you want to transfer the images. Both images and videos can be transfered, although there is a 30 image per transfer limitation when moving pictures from the camera to a tablet or smartphone. Both Android and iOS is supported. 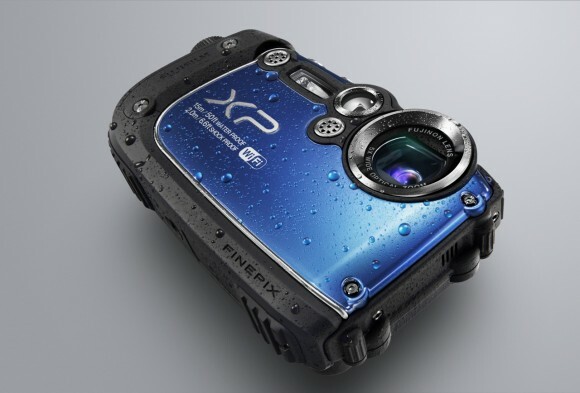 Because the camera is aimed at those engaging in rugged – and likely fast-paced – activites, the XP200 also offers a 10 frames-per-second continuous shooting mode. If that’s not enough, there’s also an ultra-high-speed mode that can snap 60 frames-per-second for a maximum of 60 frames. Continuous mode is activated by a dedicated button on the back of the camera, meaning you won’t have to toggle around the menu before getting that here-now-and-then-gone shot. The camera will be available in yellow, red, black, and blue in May for $300.